The only thing we have in common is the Sun. I do have to admit that the data does not go back far enough to make this proof that the warming on Earth must be the Sun, however this is no worse than much of the anecdotal evidence presented by the Reverend Al Gore of the Church of Global Warming (as he had his coronation during the Academy Awards in February 2007). What the religious zealots of Global Warming say about of Mars’ warming, is wobbles in Mars’ orbit are the cause. Unfortunately the Earth’s orbit also wobbles. Some naysayer’s of this data also claim that sun activity has decreases in the last few years, however when I have read information about this, it does not appear to take all types of Solar activity and the often delayed reactions of different Solar activity. This data may also speak for the Earth to decrease its warming sooner than expected, if this holds true, the Reverend Al Gore of the Church of Global Warming will not be able to hide in the future predictions 50+ years out when they will not be around to answer for their lies. 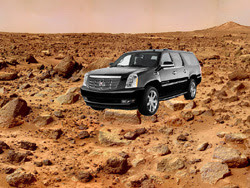 Must be the SUVs on Mars!